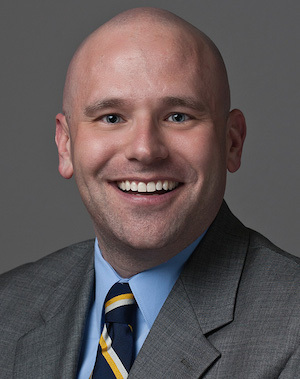 Matthew Manfra will join the George Washington University later this summer as its new associate vice president for alumni relations, the university announced Wednesday. Mr. Manfra, currently the assistant vice president for alumni engagement at Syracuse University, will begin his new position Aug. 3. Matthew Manfra will join GW as its new associate vice president for alumni relations on Aug. 3. At Syracuse, Mr. Manfra led the offices of annual giving and alumni relations to create joint outreach efforts to the university’s 250,000-plus alumni and friends. Previously, he served as assistant vice president for alumni relations at the University of Northern Colorado, where he worked with alumni volunteers to create a robust program for more than 125,000 alumni. His focus on marketing and outreach led an alumni relations transformation at Northern Colorado, where the program was a leader in providing news and information to alumni and friends. Mr. Manfra previously spent four years on the alumni relations staff at Rutgers University, first as director of regional clubs and later as director of outreach programs. He began his career in higher education in 1999 at his alma mater, The College of New Jersey, where he held roles in admissions, human resources and as the alumni affairs director. He also served as a volunteer on the executive board of the TCNJ Alumni Association executive board from 1999 to 2002 and again from 2009 to 2011.